Build-a-lot Game Review - Download and Play Free Version! Send the Housing Market Through the Roof as You Build, Buy, and Sell Houses in This Catchy Real Estate Game! Easy to follow tutorial makes for quick mastering of controls. Your successes will periodically be rewarded through receiving random checks. Each level brings about new challenges that are clearly explained. Levels are small and can be easy to complete. 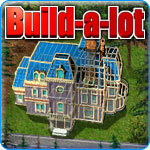 Become a Real-Estate Tycoon in Build-A-Lot! 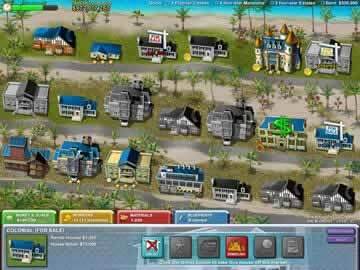 Build-A-Lot puts you in control over the real estate in a variety of towns. In Career Mode buy, build, remodel, and sell various styles of houses and other buildings at the request of the mayors of eight different towns. It's up to you to just flip houses or sit back and collect rent for easy profit. 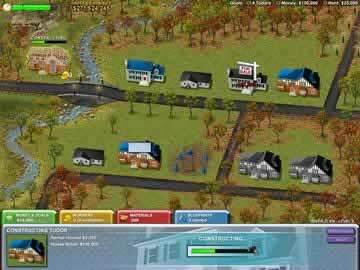 Gamers of all ages will understand how to play this real-estate strategy sim. With an interactive and intuitive interface Build-A-Lot practically eliminates the need for the helpful tutorial it provides in the town of Meadow Dale. The game takes you through eight different towns including Pleasant Valley, Evergreen Park, Lakeside, and Palm Grove among others. Before you build anything or make any money you must buy the blueprints to the building and have enough workers and materials for the job. These all come at a price so save and spend wisely. Simply by dragging your cursor over a job will notify you of how many workers and materials are necessary. You can increase your rental income by upgrading your properties with additions to your buildings that include new paint, remodeled bathrooms, new fireplaces, custom mill work, wireless intercom systems and game rooms. Even add bowling alleys and pools to special clients' houses. This will increase your total worth and provide more money to build, buy or sell houses. You Are Not Restricted to Just Houses! You can also build other buildings including saloons, cinemas, post offices and fire stations. But it's up to you to build, manage and maintain these buildings too. The game also features a Casual Mode where you answer to no one. You have to complete the first few levels of Career Mode to make Casual Mode available, but once you do you can set up your real-estate kingdom at your own pace. Increase your total worth to the highest possible amount. It's not all happy-go-lucky on your properties all the time. It's up to you to maintain the houses when a repair is needed. A variety of problems may arise including plumbing, electrical, structural and pest problems. These problems require workers and materials. Don't neglect your properties or tenants. Try Build-A-Lot for Some Money-Managing Fun! This is a great sim for anyone interested in real-estate or money or business management games. Play alone or play with a group and try out Build-A-Lot for its award winning features. Get addicted to the lucrative real-estate markets of Build-A-Lot and forget about the economy! Build-a-Lot is an interactive real estate development game that will have you building, drafting plans, and planning out neighborhoods. The game is broken into 40+ levels, all with different scenarios and objectives. You will buy and sell homes for a profit, while completing objectives and building quality neighborhoods. One of the best things about Build-a-Lot is the ease of play. The tutorial is clear, concise, and explains all the game's intricacies. After playing the tutorial, which is cleverly incorporated into levels, you will be a seasoned veteran developing the best neighborhoods. The gameplay in Build-a-Lot is divided into four main parts. You earn money through collecting rent and then you use that money in three ways. You draft plans, purchase lots, and buy materials. Drafting blueprints is a one time expense and is necessary when building both homes and buildings. Blueprints are expensive, especially as the homes or buildings increase in size, however they are essential. Purchasing lots, another facet of the game, is a great way to build revenue and increase your total number of homes. Lots tend to be about 25,000 dollars . They are relatively cheap and can generate you a lot of money if you build on them and then sell. Buying and selling quickly is a great money making strategy of the game. The final key element of the game is buying materials. Materials might seem expensive, however these are the only things needed when building a house. For example, if you buy a tutor style home it will cost you 30,000 dollars in material (only a fifth of its total value). Buying materials in bulk and building a lot of homes might be expensive at first, but it will make you lots of money. A drawback of this game would be the rate at which you advance. Playing for less than 10 minutes you will most likely complete at least 2 levels maybe even 3. For some this element might be a plus because it keeps the game moving, however it eliminates the “start small and grow” strategy that makes simulation games so great. Also, you won't be able to build and develop a single neighborhood because of the level system that will constantly have you advancing and starting fresh. This can be especially frustrating, for example, if you have built a superior neighborhood in level 7. After you complete the level and advance to 8, your neighborhood and the houses are gone and you will be starting fresh with new objectives and materials. Overall, despite the level associated drawbacks, this game is a fun real estate and neighborhood development game. This game will keep you entertained for countless hours regardless of your real estate expertise. The smooth gameplay and great tutorial will get any gamer, regardless of skill level involved and entertained. Build-a-Lot is an enjoyable game and is very deserving of the strong “7” score its received. Play and enjoy. See how houses are built, upgraded, and sold for profit.